Nick and I recently celebrated our 10 year wedding anniversary. I kind of can't (but also can) believe how quickly time has flown by. Knowing this big milestone was coming up, earlier in the year I had grand ideas of anniversary vacations, or huge house renovations. Images of beaches and hard wood floors danced in my head. But when the day finally came the reality was those big ideas would have to wait until next year. But I had Pinterest boards burned in my brain, color swatches pulled, and tile samples pinned. I couldn't call it quits entirely (I'm no quitter)! 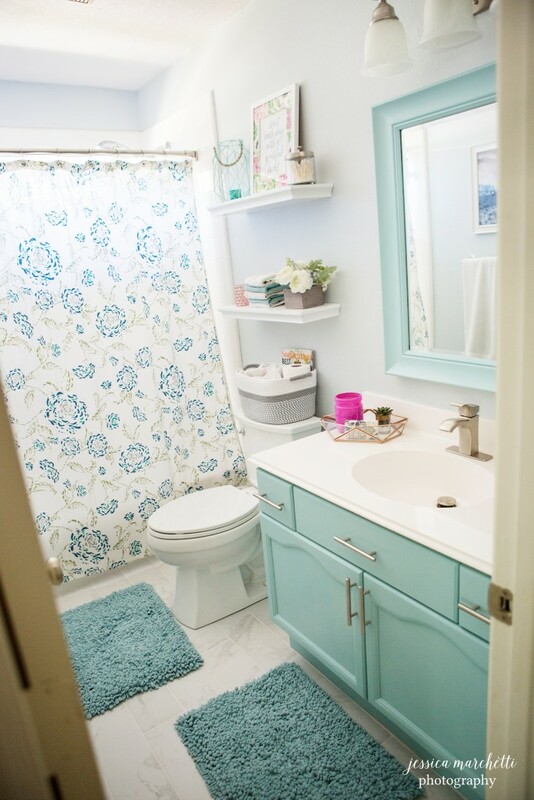 With the help of credit card rewards points and an amazingly patient husband who is willing to watch YouTube videos on DIY, we decided to update our guest bathroom together to celebrate. This is one of those projects that has been moved to the bottom of the house priority list many times in our 5 years living here. Ya'll, it was the last remaining bathroom that still had CARPET. 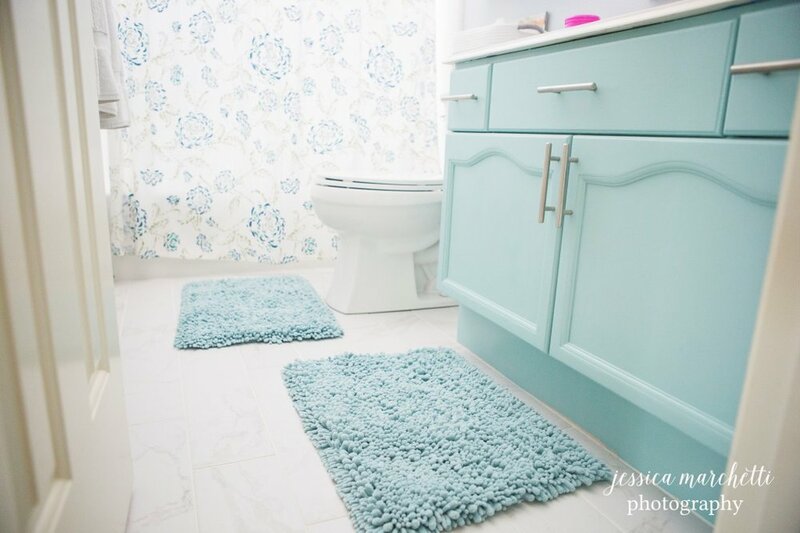 The fact that we bought a house in 2012 that had not 1, or 2, but THREE bathrooms carpeted still baffles my mind. I'll give you a second to shudder at the idea of years of men and children's potential "misses." Highest priority = tile floors. It also was the only room in the house that 100% has no design connection to the rest of the house. From the wall color to the decor elements it doesn't look like it belongs. 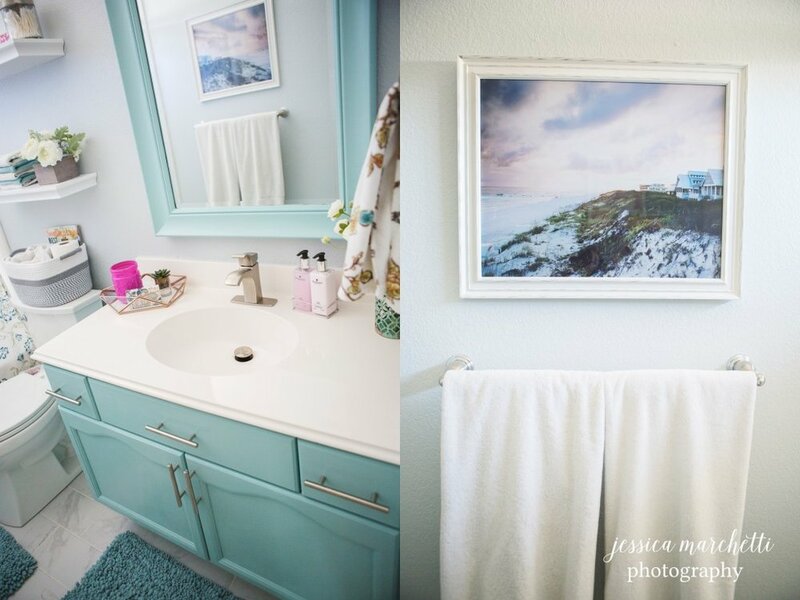 We have coined this home the house of turquoise and it's comprised of various shades of gray, white, black and blue. 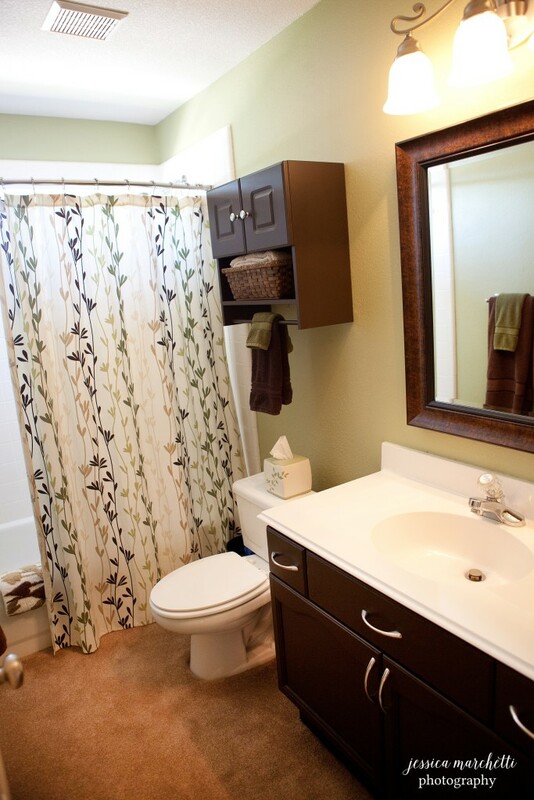 This bathroom had olive green walls, brown carpet, and dark, heavy, brown accent pieces. It wasn't horrible (one reason why it has taken us this long to redo), but it just wasn't us. The day I went upstairs to take my "before" pictures Nick had surprised me and had already cleared out the entire room and was sanding away. God bless him, but I was secretly bummed I didn't get an accurate representation of the real "before." So these pictures are technically from when bought the house but hadn't moved in yet, so we had a different shower curtain and accessories, but it's a really close representation of what it once was. Thank you to American Express membership rewards and Home Depot gift cards having a high return rate we were able to get almost everything using gift cards. Since we had a very tight budget we tried to reuse as much as we could with face lifts and paint. 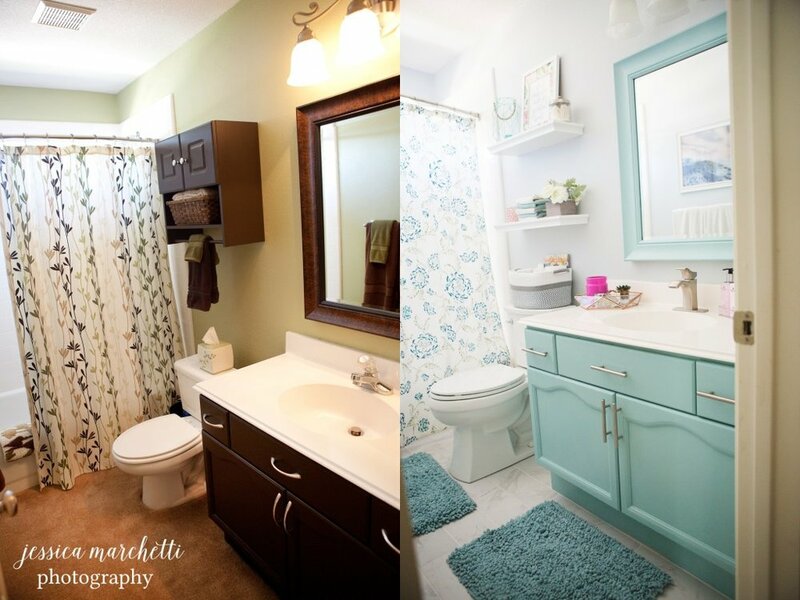 We kept the same mirror and cabinets which was a huge savings. Major shout out to the paint department at Home Depot too. We knew we had the gift cards there, but the colors I really wanted were at Sherwin Williams. So I brought them Sherwin Williams color swatches and they made me the colors with their paint! I found this Carrera Matte porcelain tile at Home Depot too, and it was only $1.99 a square foot! Since our bathroom is so small the tile itself was roughly $60. I will say I LOVE the color we chose for the cabinets and mirror, but the wall paint color isn't exactly what I envisioned. When you are looking into the bathroom from the hall it looks gray (which is what I wanted), but when you are on the opposite side of the room with the sun shining in, it definitely has a lot of blue in it. 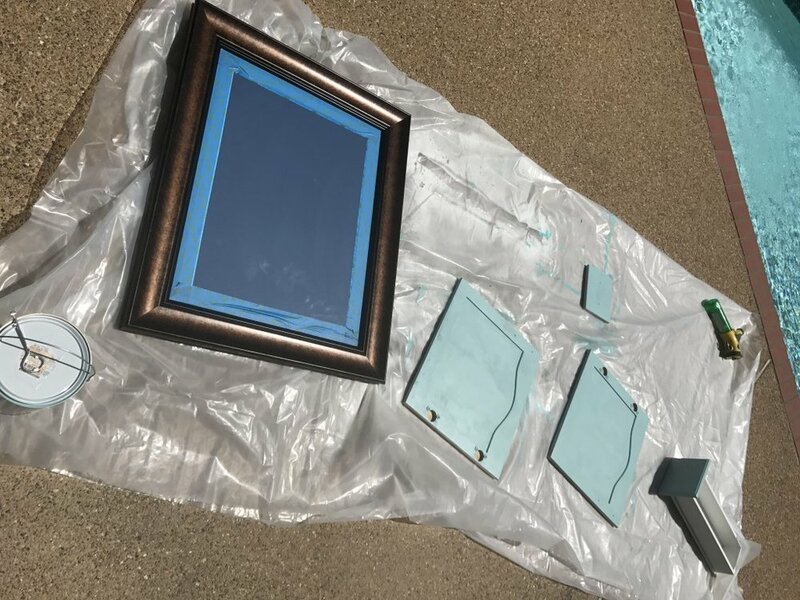 I really didn't want blue on blue, so one day, when we muster up the energy again, I'm going to repaint the walls (along with trim and doors, it makes me CRAZY that they aren't bright white). We finished off the cabinets with new pulls. I went off the gift card train for these though. They were $6 a piece in the store, and I found a 10 pack on Amazon Prime for $38. Which worked out great because I used the leftovers in the downstairs bathroom! I originally planned to reuse the same wall unit and just paint it the same color as the cabinets, but I never liked that I couldn't have as much decor in there and how chunky I thought it looked. Enter simple white shelves! I repurposed the flowers, pink glass cup and q-tip/cotton holder from other places in the house. The grateful sign and blue lantern I scored MAJOR on sale and paid $10 total for both, and snagged the gray bin from Home Goods. The last couple of big ticket items that made me really happy were the elongated toilet (my oh my how life has changed in the last 10 years) and a new faucet. Both of which were from, you guessed it, Home Depot using gift cards. Lastly, you knew I couldn't complete the project without one of my fine art photography pieces. After narrowing down my choices to 10 finalists, taking a poll on Instagram, and changing my mind 100 times, I ended up with this beachy sunset in Watercolor, Florida. I had always envisioned it somewhere in my home, and I loved that it tied in the pink accent colors I had. 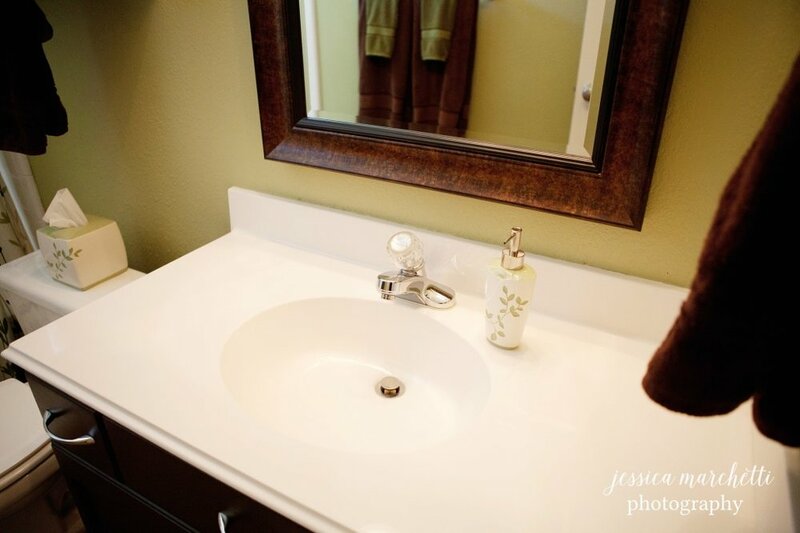 It's very serene and a perfect addition to the bathroom! I love that you can see it in the mirror's reflection when you walk in too. This is the wall you see when you enter and exit the bathroom. It's been this color combo for a few years now. Can you believe what it looked like before? It just didn't belong! One thing I actually love doing is making my own flower arrangements. Hands down, Hobby Lobby has the best collection of silk flowers and if you check their weekly ads enough they do 50% off florals pretty often making it crazy affordable. If you compare their quality to Pottery Barn it's VERY close.